This is no easy task! He begins in April every year working with State Council, the village of Mount Prospect and Store Mangers. He calls each Member in some cases several times to get to get staffing set up for the local businesses and the intersections. He is a credit to our Council and our Organization and is an example for other Chairman to follow! Was awarded the Shining Armor Award for his service to the Order with distinction during his first year of membership. 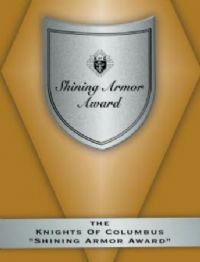 The “Shining Armor Award” is given to those men that exemplify what a true Knight of Columbus is. • Be involved in at least 3 council service programs. • Attend at least 3 council business meetings. • Receive their Second and Third degrees. • Meet with their council’s insurance representative. • Recruit at least one new member.